The unemployment rate has fallen to 7.3pc, with the number of people out of work nationwide now standing at 166,700. Unemployment in Ireland is now at its lowest level in almost eight years, according to the latest figures from the Central Statistics Office (CSO). 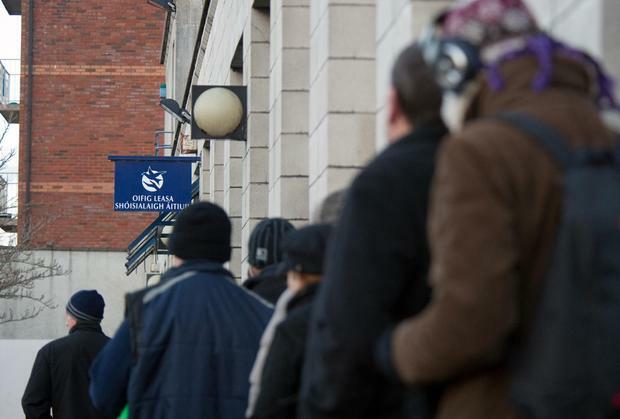 The latest data shows that the number of those on the live register has now more than halved since the peak of the crisis back in 2012, when unemployment hit a high of over 15pc. The latest figures will come as a significant boost for the Government. With continuing growth in the number of jobs being created in the economy, the data appears to indicate that the short-term impact of Brexit on jobs has not been as pronounced as first feared. The rate of 7.3pc is also a substantial decrease on the same month for 2015, when unemployment was at 9.3pc. There are now 36,200 fewer people on the live register than there were this time last year. The figures reveal that the unemployment rate for males was 8.3pc, while the female jobless rate came in at 6.1pc. Youth unemployment is still quite high however, standing at 15.5pc. While jobs are being added consistently to the Irish workforce, skills shortages are starting to emerge in some sectors. Ireland's inability to develop enough tech talent has caused intense competition among employers, it has been claimed. Hays Ireland managing director Richard Eardley said the lack of available talent isn't an exclusively Irish problem, but that Ireland's educational system is lagging behind. "Technology develops at a phenomenal rate and the educational system can't produce enough people to keep up with the pace of the change," Mr Eardley told the Irish Independent. The recruitment boss ruled out emigration as a reason for the lack of available tech workers and criticised the Government's educational response to changing technologies. "Back in 2014 the UK was revamping all of its ICT education so that kids as young as five were learning to do coding. Why is it that we have to wait until 2019 to get computer science onto the Leaving Cert curriculum? "Why haven't we got it in primary education?" he said. Mr Eardley was speaking ahead of the publication of a new salary survey from Hays that showed more than three-quarters of employers here expect hiring challenges in 2017. In a direct response to the skills shortage a quarter of Irish firms are increasing their training and recruitment budgets, with 20pc pumping up their marketing spend. In the construction industry many companies are looking abroad to fill vacancies in areas such as engineering and architecture, the survey found. "The demand for labour, particularly in technical fields, is so high that candidates can essentially pick and choose who they work for and push for higher salaries," Mr Eardley said. "This is in stark contrast to just four years ago where for many it was a matter of taking what was offered. Employers need to adapt to this changing landscape." Almost half of employees are unhappy with their salaries despite recent increases. Meanwhile 44pc of employers said unrealistic salary expectations is becoming a major issue when hiring. Just under half of those surveyed said they planned a job change in the next year.